Exxon Mobil is finally admitting to investors that billions of barrels of oil may be stranded assets - too expensive & too destructive to our climate to ever drill out & sell. That's after decades of deceiving the public on global warming. For the 3rd quarter of 2016, profits fell 38%. "Oil companies are admitting the future isn't oil," tweets the Wall Street Journal's Christopher Mims. "Think of all the nations, not just stocks, this puts into terminal decline." And states - what about the budgets of Alaska, North Dakota, Louisiana, Texas and other places that are so heavily dependent on oil revenue? Every year, headlines are filled with reports of tainted Halloween candy. 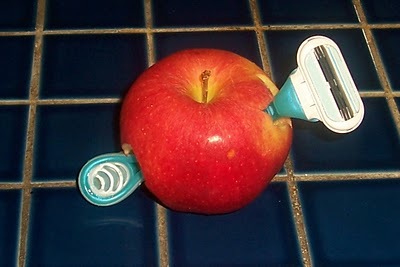 Razor blades in apples! How would you hide one without making it completely obvious? They never say. Poisoned candy! But every kid knows exactly who gave what candy - if you wanted to hurt kids, giving out poisoned candy would be no more secretive than chasing kids around your neighborhood waving a rake. Manistee, MI: Razor blade in candy turned out to have been a hoax by a family member with mental health issues. Hopkinton, MA: New, wrapped discs of toilet bowl cleaner found in trick-or-treating bags, despite kids not being able to say who gave them out. This was apparently supposed to be dangerous because kids are so stupid they'll eat toilet bowl cleaner. Poisoned Halloween candy is an urban legend, but that doesn't stop local and even national news from reporting every flimsy story as a WARNING FOR PARENTS TONIGHT. The follow-up news confirming the hoax inevitably gets much less coverage. Don't inspect your kids' Halloween candy - it scares them for no reason. And to follow the latest scares - which again, are almost always fake - follow Lenore Skenazy's Free Range Kids blog. Go like Years of Living Dangerously on Facebook for more videos & info.